Kit contains Xenon Flashtube as found on aircraft, camera flash units, signal beacons and disco lights. Adjust to flash from 1 every three seconds to 3 flashes per second. CAUTION: Connects directly to mains power supply. Must be put in a suitable enclosed box before using. Two PCBs for different mains voltage. 6V DC Xenon Flasher. Uses on-board EE16 transformer. Uses a neon to trigger the Xenon tube flash. The most powerful 'bug' available for its size, 3V supply and number of components. Guaranteed to transmit over 100 meters within buildings and to 500 meters in the open. Easily tunable in the FM band. Greater range at higher voltage and better aerial. Miniature transmitter which attaches in series with one of the two lines to your telephone. Transmits over 200 meters to an ordinary FM receiver. Transmits further if the FM receiver is near the phone line. Tune with ceramic trim cap. Uses the phone line as an aerial and power source. More powerful FM transmitter 'bug' than Kit 7. Tank oscillator coil built into the circuit board. Can be tuned anywhere in FM band. 9V battery operation. Over 400m range in the open depending on aerial used. K18 PCB now has 5 pairs of SM pads for SM resistors to be supplied later. A sound activated switch and an FM transmitter joined together to make a voice activated FM transmitter. Set the level of sound that it will respond to. Two stage transmitter needs tuning to get best results. Tuning Kit and instructions enclosed. Transmits up to 1 km in the open depending on the aerial used. Our most powerful FM 'bug' to date. A two stage FM transmitter with an RF transistor (ZTX320) in the output stage. 9V operation. On/off switch mounted on the PCB. Good value-for money & simple circuit to generate square, (pseudo) sine and triangle waveforms in the audio range. Uses quad op amp LM348. Simple circuit to generate square waves of approximately 1Hz 10Hz 100Hz 1KHz 10KHz & 100KHz. This is the most important piece of equipment for testing and measuring digital equipment. It is usually used in fault finding and testing but can also assist in design work and to find out how digital equipment works. Switch for either TTL or CMOS. Our own modern design using a PUT. Includes detection circuit for very fast pulses. Gives visual (3 LEDs) and audio (piezo buzzer) response. Control the speed of any common DC motor rated up to 100V (5A). Operates on 5V to 15V. Uses NE556 to pulse-width modulate a high current switching power transistor, TIP122. In this way motor torque is maintained. Adjustable speed control. Box mounted. This kit allows controlling the speed of a DC motor in both the forward and reverse direction. The range of control is from fully OFF to fully ON in both directions. Normally, switches are used to change the direction of rotation of a DC motor. Change the polarity of the applied voltage and the motor spins the other way! However this has the disadvantage that a DPDT switch has to be added to change the polarity of the applied voltage. Now you have two things to control the motor – a direction switch as well as the speed control. Also, it is not a good idea to suddenly reverse the voltage on a DC motor while it is spinning. It can cause a current surge that can burn out the speed controller. Not to mention any mechanical stress it can cause as well. This kit overcomes both these problems. Make this general purpose 3 1/2 digit LCD panel meter into your own voltage or current meter or custom-make it to measure voltage input from a transducer. Full details are given in the documentation. Uses the very popular 7106 IC. 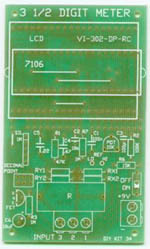 The LCD section of the PCB may be cut off and mounted separately. LCD data sheet. VI302-DP-RC pdf file for Kits 2 and 34. 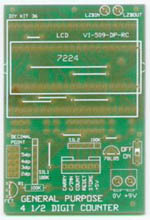 A double-sided board designed to eventually replace Kits 2 and 34. Two or more counter modules may be plugged together with the 6-pin sockets & harness provided. Uses a single-unit 3-digit LED display and is built around the 14553 & 14511 chips. Box & battery are provided. The separate COUNTER MODULE shows how to use the Kit as a counter. Has COUNT & RESET switches with debounce circuit built in to eliminate problems from noisy switches. 9V battery operation. 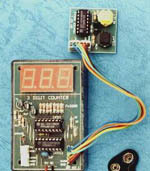 This general purpose 4 1/2 digit LCD counter is built around the 7224 IC. All the 7224 pins are brought out. You can custom design it for your own counter application. 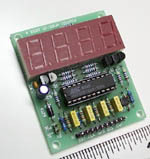 We provide 3 complete text book timer circuits all in the one kit. One is traditional 555 timer circuit, the second uses a 555 to pulse a counter while the third uses the discharge of a capacitor to time a period. The first in a series of counters using uC's. This kits clearly shows how uC can more than replace a host of ordinary logic IC's. This is a single-sided PCB. It will replace the old Kit 1. It will do much more than Kit 1 for about the same price. Several versions of the software have been made in response to special customer requests. If you want these or similar small changes in the software for no extra cost contact us. 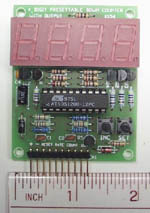 4-digit Timing Module with 6 types of firmware. This kit is the hardware platform for a number of different timing modules. The hardware is the same for each kit - the only change is the firmware programmed into an AT89C2051-24PC microcontroller. The kit itself comes with one firmware chip, a Programmable Down Timer from a maximum of 10,000 seconds. Other firmware chips are listed below. For intermittent operation of circuits and equipment. 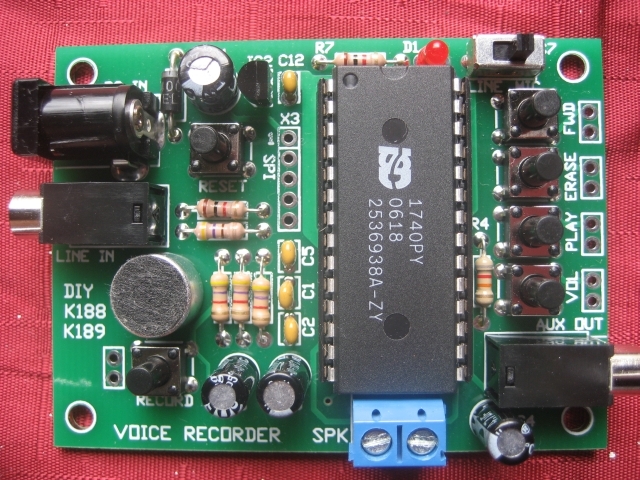 Non-volatile multi message recorder using ISD chips. Just change one resistor for longer duration. Standalone operation using just six onboard bottons. Record via built - in microphone or external line in. Complete AM radio on a PCB. Tuned radio frequency front-end, single chip RF amplifier & detector and two stages of amplification of the audio signal into a speaker. All components supplied. Coil prewound. Excellent for schools. Uses MK484 radio IC. double fun: building and listening !